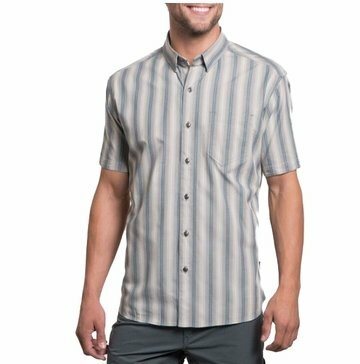 "The KUHL BOHEMIAN SS SHIRT features a cotton/polyester blend fabric with UPF 20. The cotton breathes freely and gives a soft hand, while the polyester adds resiliency. This quick dry, wrinkle resistant, and easy care shirt is ideal for travel in hot climates. With a custom Jacquard design, button front and a chest pocket, the BOHEMIAN SS shirt looks at home in the desert, the caf, or on the trail. An inside security pocket provides peace of mind while traveling.